It’s no secret that I AM A BIG Rachel Van Dyken fan. Yes, this author could write about anything and still have me going crazy for her books. But there is one book from the Eagle Elite Series that stood out from the rest. From the moment I read Elude , I knew this book was going to steal my heart. And boy oh boy did this book left me breathless, raw, and exposed. The story of Sergio and Andi was a story that had no words because their story reminded us all that it’s the unexpected that changes our lives. And so when I discovered that RVD was going to write a continuation to Sergio’s story after losing his wife, Andi, a part of me was torn. 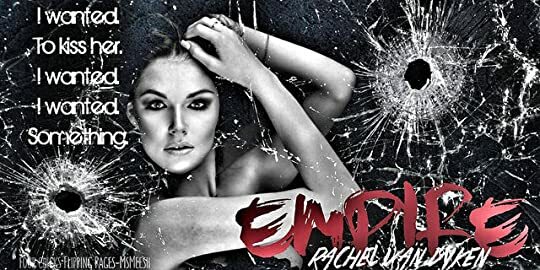 Torn in the sense that I don’t know if there could be another heroine that could steal my heart as much as Andi did and torn if I my heart could take another raw emotional journey. And the beauty of reading an RVD book is that she makes readers see and feel a second chance love story in a new raw perspective in the eyes of Sergio and his new leading lady, Val in Empire. Before I begin my review, it is highly recommended that you MUST read Elude before reading Empire. Readers need to know the backstory of Sergio in order to fully understand all the range of mixed emotions he goes through. Empire is a story where your are asked one question. Do you believe in soul mates? Can the heart love again? Can it truly move on and be at peace? Does loving again mean the memories of your first love are erased? Or does it take finding the right person to make you see that letting go doesn’t mean forgetting the memories? Sergio Abandonato thought he lost his everything when cancer took away his wife. His life. His soul. His purpose. His everything. But the funny thing about life, it moves on. It doesn’t stand still. And two months after Andi's death, her memories still haunts Sergio. How could he ever love again? With The Empire beginning to show cracks, he is forced once again to another arranged marriage. Will this new bride find a way to his broken heart? Before Andi passed away, she left Sergio a bucket list and a letter of her wishes. She informed him that she was releasing him and wants him to love again. So can Sergio move on with his new bride to be, Val and follow the wishes of his beloved wife, Andi? Val is betrothed to marry Sergio. Their marriage is what is needed in order to restore power and keep The Empire alive. So when she meets Sergio, she is intrigued by this broody, raw, and beautiful man but knows loving him will be the hardest part since his heart is torn and struggling. Can Val break through his hard exteriors and help him face his inner demons? Empire is a story that grips you to the core. I mean your heart will burst with heartache, love, compassion, and hope. I thought I could never love anyone as much as Andi but I was wrong. Ms. Van Dyken proved to her readers that she wasn’t going to replace Andi but she was going to mend our broken hearts with a character that can only give Andi’s memory justice and that is through Val. For Sergio and Val, their relationship may not be the conventional love affair but it was the kind of love that tugged every strings of your heart. Sergio has always been an raw enigma of a character and closed off. And so a part of me was beyond excited to see him finally open up again and it all it took was his deceased wife’s wishes and a young beautiful bride to put a chink in his armor. I honestly don't think this book could be reviewed with just words alone because this book is about HEALING and coming to peace with whatever life throws at you. Losing someone is never easy and the memories of our loved ones will always be there to remind us of the good, the bad, and those special raw moments. And for Sergio, his story was not just saving The Empire but saving himself. And his savior was just not one person but two. His Andi and now his Val. Although Andi will go down as one of my favorite heroines because she lived life to the fullest and came to accept her time on earth was coming to an end, a part of my heart rooted for the unsung heroine, Val. Val understood she was not competing for Sergio’s love but learning to love all parts of him. And learning to love meant embracing his deceased wife and not eluding it. So as much as we try to elude death, the reality of it is that it’s something that’s inevitable just like love. And for Sergio, saving The Empire might have been the end goal but finding love again was his salvation. 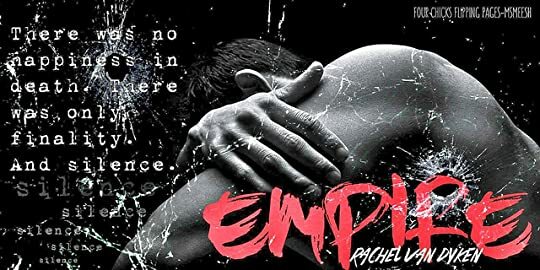 So if you are looking for a book that weaves loss, romance, hope, and second chances to another level then I highly recommend you to read Empire by Rachel Van Dyken.